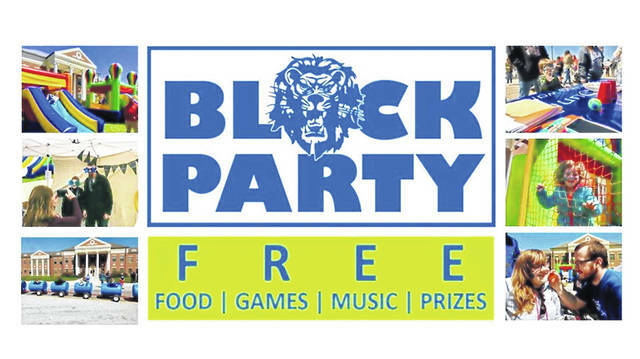 On Sunday, May 5, the Washington Court House City School District is hosting its second-annual block party from 12 p.m. to 4 p.m. According to its Facebook event page, “Blue Lion Block Party,” there were over 3,000 people who attended last year’s party. There were over 40 local businesses, churches and organizations supplying free food, games, entertainment and prizes. This year there will once again be free food, games and entertainment. Performances will be ongoing during the party and have been expanded upon since last year. Bouncy houses, face painting, classic carnival games and different competitions will be available during the party. There will be a booth for attendees to register for several door prizes at no cost. “We are going bigger,” Bailey said. He explained that the block party does not use funds from the school or taxes. There are some ways to gain funds, but much of the event comes from community involvement such as the vendors. Businesses, churches and organizations can register for a free vendor booth online at www.wchcs.org/blockparty. All that is requested of vendors is that their items be available for free to the attendees. Anyone— including businesses, organizations and churches— who want to take part but are unable to be a vendor are welcome to donate money or items for the door prizes. For more information, call Washington Court House City Schools central office at 740-335-6620.